On Saturday 15th October at Towcester Town Hall. A very successful, well attended workshop took place on 'The Armed Man' by Karl Jenkins, led by Musical Director Helen Swift, accompanied by Rowena Gibbons. Culminated in performance of the whole piece, for a small but appreciative audience at 4 pm. Those who took part and who enjoyed the performance at the end gave wonderful feedback and was well received, a good foundation ready for practice starting in the new year. Towcester Choral Society will be performing 'The Armed Man' in St Lawrence Church, Towcester on 9th April 2017. 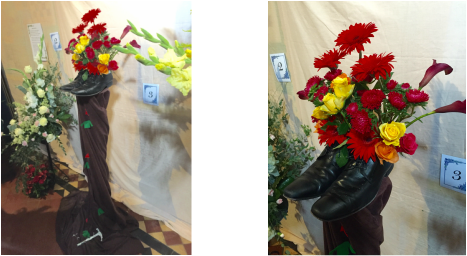 This years annual Flower Festival was 'Tell me a Story', the challenge was to find stories which had a meaning to them, morals, fables, fairy tales and Bible Stories. This year there was over 70 entries which covered the entire church with beautiful flower decorations and the church smelt amazing for the entire weekend. Lots of people took part for themselves as well as for local groups and organisations to take part this year the Choral Society left their display in the hands of choir member Catharine Tarbun who did a wonderful job of displaying their chosen fairy story Elves and the Shoemaker. See for yourself the great job she did on this and thank you again for a wonderful display. Next years display will be to celebrate 1100 years of modern Towcester , and is titled 'Towcester becomes a Town'. If you would like to take part please contact the choir directly. As always, this summer we have held our annual summer cream tea event at a members home, and this year the weather was again kind to us. We had a wonderful afternoon in the garden with lots of lovely members and their family and friends join us to help fundraise for the choir. This year we managed to raise a wonderful amount of money £248. Thank you to all who took part and helped make this event possible. On Sunday evening, 20th March, St. Lawrence Church echoed to the music of Handel, when Towcester Choral Society performed Handel's 'Messiah' as their Easter concert. The choir performed along with the South Northants Festival Orchestra, and soloists Claire Turner - soprano, Morag Boyle - alto, James Oxley - tenor and Edward Price - bass. With a packed church, the audience was incredibly complimentary on how wonderful the performance sounded. With Handel’s much loved 'Hallelujah Chorus' the audience accepted an invitation to stand to experience the joy and power of Handel’s music. Towcester Choral Society were thrilled to be part of the Towcester charity calendar 2016, all funds raised went to The Hope Centre in Northampton and St Lawrence Church. The calendar, its contents and sales were organised by Andrew McGarry a local Big issue seller who over a year ago was homeless, is giving something back and raising awareness for those who are in similar situations to himself. The Choral Society is the month of March so keep an eye out for us if you have one.